Never heard of elephant polo? Yes it’s for real and there’s even an annual Asian elephant polo circuit with the grandest and most extravagant bash held in Bangkok, Thailand with all the high society glamour and luxury sponsors as any horse polo tournament. 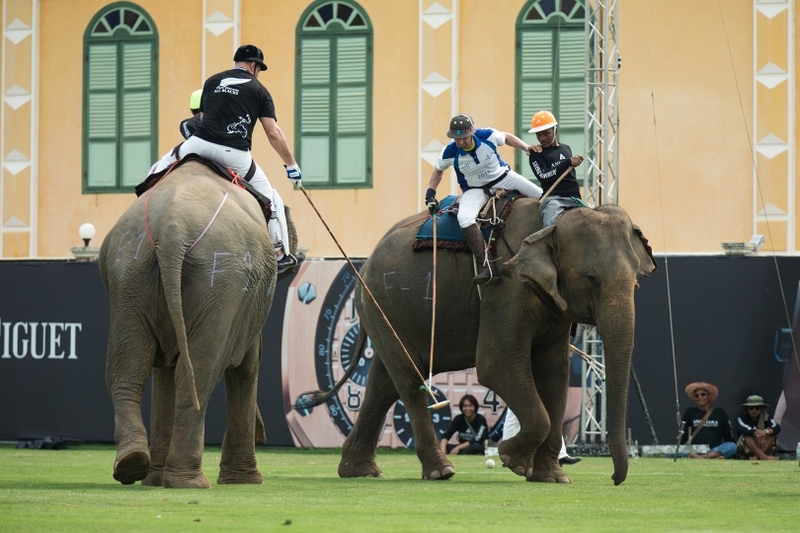 Thailand’s 16th annual King’s Cup Elephant Polo Tournament is ready to welcome players, spectators, and media from across Asia and around the globe coming to play and party at the riverside location next to Anantara Riverside Bangkok Resort. Aside from action on the polo pitch, festivities include a cultural opening ceremony with blessings from Buddhist monks, Thai food village, live music performers and DJ parties, pop-up restaurants from Bangkok’s most popular international restaurants, night time parties and an club tent sponsored by the city’s top bars, kids’ activities and entertainment all weekend long. This year introduces an early morning yoga class on the riverside before feeding the elephants breakfast! All tournament guests staying at the Anantara Riverside Bangkok for the weekend event will have a chance to win one of 10,000 incredible prizes including trips to the Maldives and the winner of the famous annual Best Dressed Award on Ladies Day will win a 4-night stay at Anantara Al Jabal Al Akhdar with flights courtesy of Oman Air. The best part is that all of this activity and the money raised goes towards the well-being and conservation of endangered elephants in Thailand. In addition to the 30 rescued street elephants who have been taken off the streets and now enjoy a comfortable lifestyle at Anantara Golden Triangle Elephant Camp & Resort’s onsite Elephant Camp, the tournament allows an additional 50 street elephants a rest from their work routines, during which they are well fed, provided with a native forest environment, and receive essential vitamin supplements, full veterinary checks and care for the duration of the event. Through the tournament, Anantara Hotels and Resorts has raised over USD 900,000 to date which has gone to various charities that benefits Thailand’s elephants. These include housing for the mahouts and families, shelters for the elephants and a mobile blood centrifuge and elephant ambulance for the Thai Elephant Conservation Centre (TECC). Since 2009 donations have also funded the world’s first ever elephant therapy program to research the rehabilitation benefits for autistic children. The Thai Elephant Therapy Project (TETP) was created in conjunction with Chiang Mai University and the TECC, initially allowing a further five elephants to be rescued off the streets of Bangkok, rented and trained as assistant therapists for autistic children. The program now runs free therapy sessions for Thai children every year. The money raised has also helped build the first elephant hospital in Krabi in southernThailand; research and tree planting to build elephant corridors in Kui Buri so there are no elephant/farmer conflicts; funding the first educational computer application for children to teach them the importance of conservation and protection of wild elephants in Thailand. See? It’s not just champagne, fun and games – it all goes towards a worthy cause, aiding and conserving our precious animals.